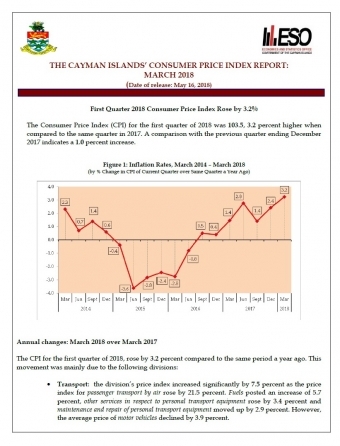 Consumer prices in the Cayman Islands, as measured by the Consumer Price Index (CPI), went up by 3.2 percent in the first quarter of 2018 when compared to the same quarter in 2017. The inflation rate is traced mainly to the price increases in transport-related items, particularly air fares which rose on average by 21.5% and fuel prices by 5.7%. Electricity rates were also higher by 16.5% in the first quarter compared to the same quarter in 2017. Other notable increases were recorded for pharmaceutical products and other medicinal products. The average prices of dental, paramedical, and hospital services remain unchanged. Among food items, prices for fruits, vegetables, milk, cheese and eggs went up. More information from the Cayman Islands’ Consumer Price Index Report: March 2018 may be downloaded from www.eso.ky.